The progressive retinal athrophy (PRA) is an inherited eye disorder leading to a degeneration of the photoreceptor cells of the retina. Initially,a loss of function of the rod cells is observed proceeding in night blindness and decreased adaptation of vision. The PRA form in Papillons and Phalènes show a wide range in age of onset maybe due to different genetic background or environmental influences. 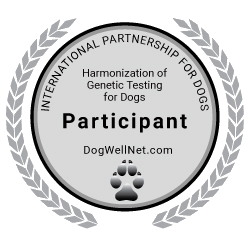 The known genetic variant explains about 70% of PRA affected dogs. So, one assumes that at least one further mutation is involved in PRA genesis.